Computer scientists have 3D-printed a xylophone* with keys shaped like animals to test if different shapes have different sounds. They called it a 'zoolophone'. The way shape and sound interact is pretty complex - it's based on things like surface vibration and the size of different components. As such, designing an instrument to create a desired sound is not easy. But a research team lead by Changxi Zheng from Columbia Engineering wanted to see if it was possible. So they created an algorithm that uses computational methods to alter the shape of three-dimensional objects with their vibration modes in mind. The goal was to use digital fabrication technology to control the acoustic properties of an object. 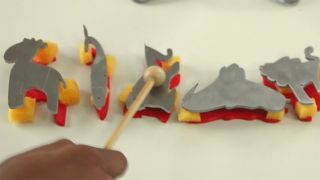 To demonstrate that the algorithm worked, Zheng's team printed out their 'zoolophone' - with keys shaped like lions, turtles, elephants, giraffes and more. Each had been carefully tuned by the algorithm to achieve a desired pitch and amplitude when struck with a mallet. As well as instruments for kids, Zheng says the discovery could have wider applications too. "Our algorithm could lead to ways to build less noisy computer fans, bridges that don't amplify vibrations under stress, and advance the construction of micro-electro-mechanical resonators whose vibration modes are of great importance," he said. The details of the algorithm will be presented at the SIGGRAPH Asia conference in Kobe, Japan on 4 November 2015. *Except it's not a xylophone, fact fans. It's actually a metallophone or glockenspiel - xylophones have wooden keys. But then the pun doesn't work, does it? Silly scientists.